Reservoir Dub » Blog Archive » RADIO SHOW 26.09.13. New radio show this thursday 26 of september! We’ll have a lot of brand new release to play tonight! 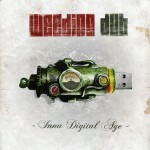 First of all, the french producer Weeding Dub has a new album called « inna digital age » released on Control Tower. We’ll play some tunes from the project between Brain Damage and Vibronics : a cd called empire soldiers. Finally, the recordlbabel Irie Ites just released a compilation called « a decade of reggae music » with 14 tunes released on Irie Ites between 2003 and 2013.